Chloe Eudaly, whose zine emporium Reading Frenzy (previously) and publishing makerspace the Independent Publishing Resource Center are PDX institutions, is running for Portland City Council, campaigning on affordable housing for all in a city whose longterm residents are being left behind by runaway rents and spiraling housing prices. Eudaly is a consummate community organizer who has helped create literally hundreds of free literary and art events, while parenting her disabled son and running a small, successful business. She's committed to the things that make Portland such a livable, arts-friendly city -- things that are under real threat from forces that are tearing apart cities all over the world. 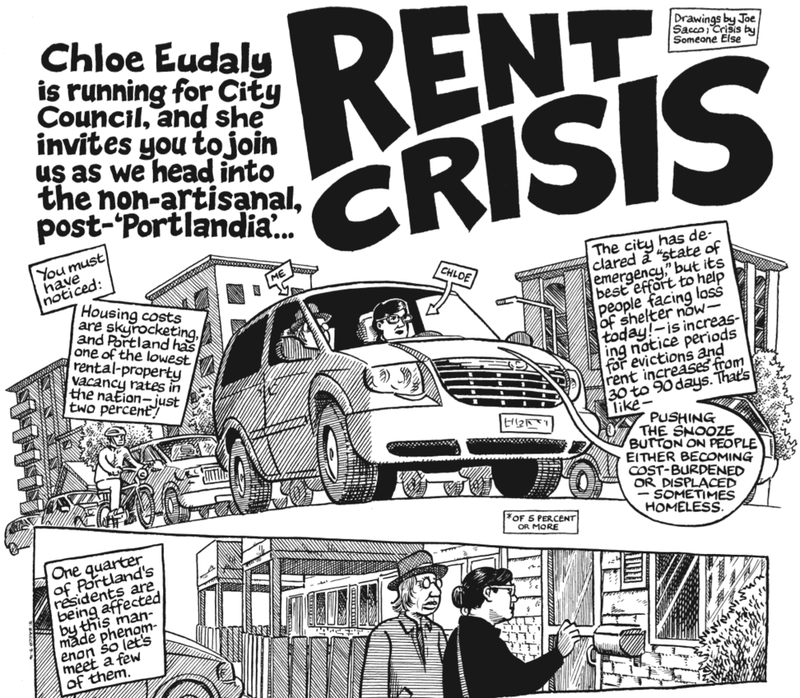 She's worked with cartoonist Joe Sacco to produce a comic about Portland's housing crisis, and has an eminently sensible slate of progressive campaign positions. If I lived in Portland, she'd have my vote. As it is, I've donated to her campaign, as a way of keeping one of my favorite places in the world as wonderful as it can be at its best. In 2001, Chloe’s life took an unexpected turn when her infant son was diagnosed with Cerebral Palsy. After a couple years of navigating the medical and service systems she had the good fortune of being accepted into Partners in Policymaking -- an intensive year-long disability advocacy training program -- which launched her on a path that she still walks today. In the ensuing years she has done both paid and volunteer work for local nonprofit organizations, has advocated and fundraised for increasing accessibility at Portland Parks & Recreation, given talks and workshops on a variety of subjects from inclusive child care to the lack of accessibility in Portland Public Schools, and co-founded the Special Education PTA of Portland, a district-wide PTA dedicated to engaging, educating, and empowering families. In 2014 Chloe's attention turned to renters' rights and affordable housing when she found herself among Portland's growing ranks of cost-burdened renters. In February of 2015 she established an online group focussed on housing affordability, renters' rights, gentrification, and displacement called "The Shed" which has since grown to more than 2000 members and has become a hub for information, resources, and support. Through this group she began having near daily interactions with people who were in crisis and struggling to keep a roof over their heads. This experience is what ultimately spurred her to run for Portland City Council. Chloe's son Henry is now in high school, uses a high tech communication device that he controls with eye gaze, is studying photography, and enjoys being a TA in his school library. These days she works mostly behind the scenes at Reading Frenzy but still enjoys hosting events, curating shows for the gallery (now temporary campaign headquarters! ), the thrill of discovering new authors and artists, and connecting adventurous readers with compelling work. In her spare time she enjoys working through her endless reading list, listening to public radio, watching British crime series, crossword puzzles, thrifting, hiking in Forest Park, rabble rousing, and singing karaoke. Rent Crisis: Coming to Your Doorstep Soon!